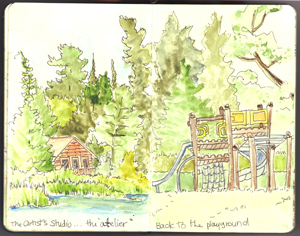 The Artist’s Studio at French Lake is amazing, and time spent there makes one long for their own little cabin on the lake. Add a playground to the mix, and you have a pretty awesome getaway! Tiny homes like this are increasingly popular. Once considered a small and simple vacation spot, you can find examples of year-round homes with less than 500 square feet of living space. If your New Year’s Resolution involves leading a simple life, take a look at these little jewel boxes.